There is not some switch in the sky that transforms a non-money into a money.That’s true as stated but trivial. If you don’t have it, or if you have it and can’t find anyone to take it, it is not a money for you. In that same way, I don’t own any Birr, the currency of Ethiopia, and no one I know would take it if I did. Still, it’s a money somewhere. In some prisons, mackerel cans serve as money. In others, It’s Ramen noodles. Indeed, anything you acquire not to consume but rather to use in future exchange is technically serving a monetary function (that is, it is used for indirect exchange). In that same way, Bitcoin has been a money for some people somewhere since October 5, 2009, the date that the first dollar exchange ratio was posted. That it took so long to get to you and me is not a surprise. Carl Menger wrote that this is the way money emerges in a market, gradually, in ever expanding circles based on access and success in doing what money is supposed to do. Men have been led, with increasing knowledge of their individual interests, each by his own economic interests, without convention, without legal compulsion, nay, even without any regard to the common interest, to exchange goods destined for exchange (their “wares”) for other goods equally destined for exchange, but more saleable. In other words, there is not some switch in the sky that transforms a non-money into a money. Discovering what goods are saleable is a matter of discovery. There is no obvious and immediate answer, and the answer is always changing. It’s a process that gradually unfolds, as human ingenuity comes up with solutions to practical problems. You can get nearly anything with Bitcoin. It’s been this way with Bitcoin. It was a curiosity. Then an investment. Then a solution for the technically inclined. Then a thing to push harder for wider acceptance. More and more people got involved, and merchants began to accept it. Then the demand grew and grew. Some have proven that you can live off Bitcoin if you are enterprising enough. Now, keep in mind that cryptocurrency’s main use is not in fact using it at the local sandwich shop. You can do that with dollars, which is probably why it has taken so long for the physical-world market to become friendly to it. There are rarified places that accept it (I have far less trouble spending this stuff abroad) but most places do not.You can get nearly anything with Bitcoin but you may not be able to use it as payment with everyone from whom you want to buy. I’ve not known entirely what to make of these various objections to Bitcoin I’ve heard for years. Are they tossed out as a problem to be solved or as a suggestive proof that there is no such thing as computer-created money that is not based on an existing approved currency? If the point is to debunk it fundamentally, I’m confident that the incredulity will gradually die off. If the point is to raise an existing limitation (“wallets are not user friendly” etc. ), that only speaks to the early point in this period of history in which we find ourselves. The whole point of innovation is to solve problems, and, as we know from the block-size debate, Bitcoin is far from complete. Let’s consider one problem in particular: allegedly, you can’t use it for a sandwich. Actually, that problem has been solved. There are many vendors out there but I chose to experiment with BitPay’s Visa card. It’s relatively new and not in broad circulation. Only 24,000 have been issued in the US and foreign nations. There’s another factor to it also: the sheer fun of it. Still, I have to say that it is wonderful. It can do anything that a regular debit card can do. You can buy groceries. You can get a drink at a bar. You can pay for a haircut. You can buy fast food. You can use it to shop online, buying anything from Amazon or eBay. I’ve used it to do all these things without a hitch. But why bother with this circuitous method when any old credit card will do? Here’s a story to explain. I was at the UPS store to mail a letter and used it. The clerk became really excited when he saw it. It turns out that he loves mining new coins with strange names in hopes that one of them will be a hit. We struck up a wonderful conversation and we both experienced a sense of camaraderie that otherwise would never have existed. There’s another factor to it also: the sheer fun of it. My goodness, I’m paying for stuff with a money invented by a handful of code monkeys that only a few people on planet earth even believed was possible a decade ago. That factor – downplay it if you want to – is truly underappreciated. How does this thing work? You sign up and get your card and go to the website to fill it up with Bitcoin. That immediately transfers to your use. Now you can carry around spendable Bitcoin. The beauty of this service is that it makes navigating between dollars and Bitcoin extremely easy and secure. Now, astute readers will be asking the question: what happens when the value of Bitcoin changes. Does the purchasing power of the debit card change with it? The answer is no. Your dollar value is locked in the moment you pump crypto into the card. Technically, what happens is that you are transferring Bitcoin to BitPay in exchange for which you have dollars to spend at whatever the prevailing rate is. 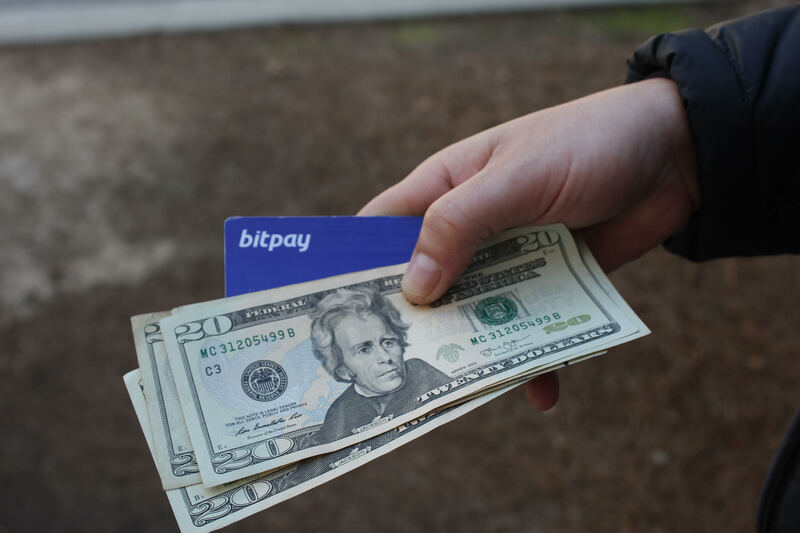 BitPay accepts the downside risk while the user loses the upside benefit. So, yes, technically, you are not exactly spending Bitcoin when you use it. You are spending dollars. If you prefer to sell Bitcoin at the time of the spending, there are other options such as the Shift card. If you are clever, you can use one card to protect against a falling price and another card to capture a rising price. It’s also true that by using such a third-party intermediary, you are giving up a key feature of Bitcoin, which is its peer-to-peer network that allows instant trading between individuals. But don’t blame Bitcoin for this. Government regulations have made it extremely difficult to move between different monetary ecosystems. None of this would be happening if the US Treasury had permitted a free market in monetary exchange instead of imposing egregious regulations. The beauty of this service is that it makes navigating between dollars and Bitcoin extremely easy and secure. For all the limitations, that alone makes it all worth it for me. Plus, as I mention, it is fun. From the very beginning of public awareness of this new technology, there has been this expectation that it should be perfect in every way or else it is not valuable. That’s ridiculous. That didn’t happen with railroads, electricity, flight, or the world wide web. Everything has to go through a process of improvement through user feedback and entrepreneurial innovation. Bitcoin is already money, just not yet a universal money. But you can feel it every day: the promise is there. It is just a matter of time and effort.